As the most widely used thickening agent in the world, sodium carboxymethylcellulose is widely used in the food industry as an excellent food additive. Many kinds of food add carboxymethylcellulose as the stabilizing, suspending and thickening agents. sodium carboxymethylcellulose can control the rheological property, structure, flavor and appearance of products, and its pseudoplastic properties can guarantee a favorable taste, so is widely used in bread, dairy products, frozen food and beverages. sodium carboxymethylcellulose can be used to prevent the protein in yoghourt from condensation, as well as sedimentation and layering. With good homogeneity, it guarantees the stability of acid beverages and the storage time can be longer. Since the pH value of acid beverage is relatively low, it has high requirements for the acid resistance of sodium carboxymethylcellulose. The higher the DS (degree of substitute) is, the better the acid resistance of carboxymethylcellulose will be. Meanwhile, the product purity will be higher (≥99.5%) and the product use will be more stable. Since thickening agents have thickening, stabilizing, homogeneous, emulsifying and gelling properties in drinks, they are widely used in beverage processing. In fruit squash, the proportion of solids is larger than that of liquids, so sedimentation of solids to the bottom of container usually arises in these drinks. When sodium carboxymethylcellulose is used in fruit squash, it enables the flesh and fruit suspending in the packaging container to be well-distributed, full, bright and striking in color, and it can also extend the storage life of fruit squash. Acid milk drink is a kind of mixed milk drink with sweet &sour tastes and processed from the materials including water, milk (or milk powder, yoghurt after fermentation and inactivation), emulsion stabilizer, citric acid, fruity essence and synthetic pigment. 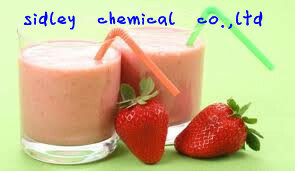 Some acid milk drink manufacturing enterprises add a small amount of juice and natural pigment in the product ingredients to increase the selling point and attract consumers. In acid milk drinks, the use of sodium carboxymethylcellulose can stabilize the texture of drinks, prevent sedimentation and layering in drinks, improve the taste and enhance the heat resistance. In the production process, some acid milk drink manufacturing enterprises only use sodium carboxymethylcellulose as the thickening stabilizer while other enterprises compound sodium carboxymethylcellulose, other thickening stabilizers and emulsifying agent and put into use in the production of acid milk drinks.